Using efficacy data developed by Dr. Dave Biddinger, Tree Fruit Entomologist with Penn State University, Dr. Greg Loeb, Professor of Entomology, Cornell University, applied for, and received, FIFRA 2(ee) Recommendations for five insecticides to include Spotted Lanternfly on their grape label. The materials are Actara Insecticide, Brigade WSB Insecticide/Miticide, Drexel Carbaryl 4L Insecticide, Danitol 2.4 EC Spray, and Mustang Maxx Insecticide. The FIFRA 2(ee) recommendation allows the use of these materials against all life stages of spotted lanternfly but the insecticide must be used in a manner consistent with its labeling. The application rate for each product is on the FIFRA 2(ee) Recommendation. Users must have a copy of the product label AND the FIFRA 2(ee) Recommendation in their possession at the time of the pesticide application. Seasonal use limits found on the label are still in force and do not change with the addition of this pest to the label. For growers in Pennsylvania - there is no need for a FIFRA 2922) recommendation for insecticides that are labeled for use in grapes. In Pennsylvania, the pest does not need to be on the label, only the target - in this case, grapes. 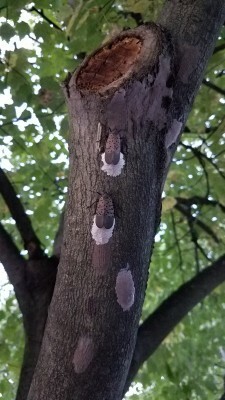 Continue to monitor for spotted lanternfly adults and egg masses at this time.